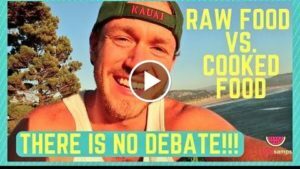 SETTLING THE DEBATE ONCE AND FOR ALL WHY RAW FOOD IS OUR IDEAL DIET!!! EAT LIVING FOODS FOR A LIVING BODY JUST LIKE EVERY ANIMAL ON THIS PLANET! EAT COOKED FOODS TO ROB YOUR BODY FROM LIFEFORCE!